The screen adaptation of Philippa Gregory’s best selling novel The Other Boleyn Girl is a dramatic story of love, passion and ambition set in the cut-throat court of Henry VIII. Mary (Scarlett Johansson), considered the more beautiful sister, gains the young king’s (Eric Bana) attention and, though married, becomes his mistress. When it becomes politically adventageous, Mary is cast aside for her dazzling young sister Anne (Natalie Portman) and can only watch as Anne’s ruthless pursuit of the crown propels her towards her doom. The Boleyn family had extensive connections with Kent; the family lived in Hever Castle while Henry VIII adored Knole. With this connection in mind, filming took place at three fantastic locations across Kent. Filming in Kent began at Knole in Sevenoaks, a grand house set in a deer park that Henry VIII was so impressed with; he demanded that the Archbishop of Canterbury, Thomas Cranmer give it to him. 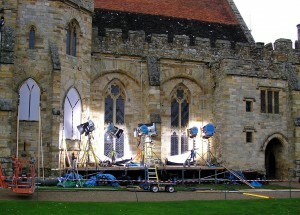 In the film, Knole was the setting for many of the film’s London night scenes and the inner courtyard doubles for the entrance of Whitehall Palace where the grand arrivals and departures were staged. Production then moved to Penshurst Place near Tonbridge, which was also once owned by Henry VIII and where the unspoiled estate and gardens still bring the Tudor era to life. The Baron’s Hall was transformed into the interiors of Whitehall Palace to film the scenes of Henry’s extravagant feast. The Tudor Gardens were also used for the scene where Anne (Natalie Portman) and the King (Eric Bana) talk about their relationship. As England’s oldest fortress at the shortest sea crossing to Continental Europe, Dover Castle was a vital strategic centre in the Tudor era and able to provide the ideal setting for the final and climatic scenes in The Other Boleyn Girl. 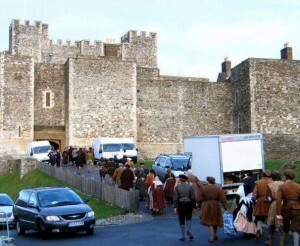 Dover Castle was transformed into the Tower of London for the execution scenes of George Boleyn (Jim Sturgess) and Anne Boleyn (Natalie Portman). Knole Park is nestled in a medieval deer-park . The area has welcomed filming from productions such as Rush (2013), BBC Doorstop Crime 999 (2012) and Pirates of the Caribbean On Stranger Tides (2011). Historic house Knole is set in a medieval deer-park in Sevenoaks. Now a National Trust property, it is over 500 years old and was once the palace of archbishops and royal property of the Tudor dynasty. Knole has previously featured in productions such as Great British Railway Journeys – Series 7 (2016), Sherlock Holmes: Game of Shadows (2011) and Pirates of the Caribbean On Stranger Tides (2011). Situated on the White Cliffs of Dover, overlooking the English Channel is the stunning medieval fortress – Dover Castle. A popular film location, Dover Castle has featured in Into the Woods (2015), Poirot “The Clocks” (2009) and Hamlet (1990). The Other Boleyn Girl features in the Kent Film Office Tudor(ish) Trail, released in May 2016, celebrating Kent’s Tudor history and film connections. The film was released on 7th March 2008 and is now available on DVD. 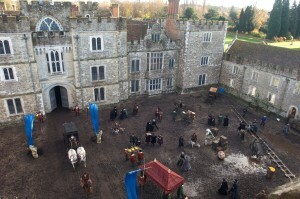 This entry was posted in Filmed in Kent and tagged Dover Castle, feature film, Knole House, Natalie Portman, Penshurst Place, Scarlett Johansson, The Other Boleyn Girl film locations. Bookmark the permalink.